Contrary to legend, the aorta of a blue whale may not actually be big enough to fit a human inside. Experts at the Royal Ontario Museum have dissected a blue whale and preserved its heart for the first time, finally giving us an intact specimen to measure the myths of the whale’s immensity against. The largest animal in the world, the blue whale has a heart about the size of a small golf cart, according to Big Blue Live, a new television series that visited the dissection lab. The Canadian museum was able to secure the body of a 76.5-foot blue whale that became trapped in ice and died, washing up on the shores of Newfoundland. The museum’s technicians extracted the entire heart from the mammal intact; it took four people to push it out of the chest cavity. The heart, the first of its kind to be preserved, weighs 400 pounds and measures 5 feet by 4 feet by 4 feet. It’s not quite car-sized, as previously thought, but it’s at least bumper-car sized. The aorta isn’t quite large enough to crawl through, but you might be able to squeeze your head in. 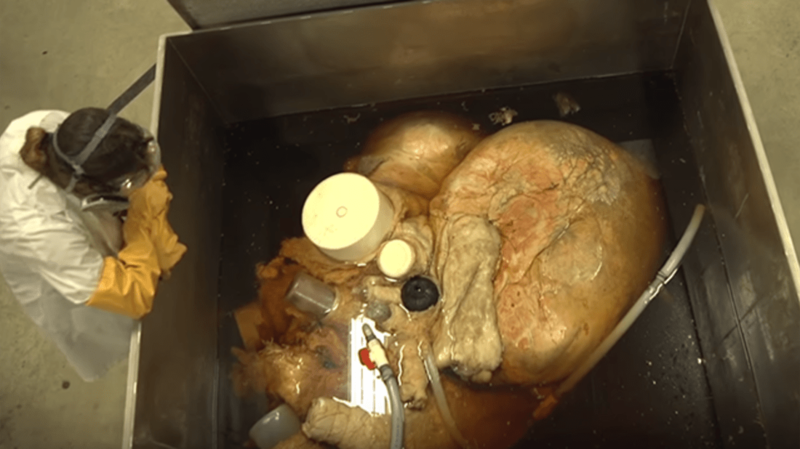 The heart could pump 58 gallons of blood per second, and required 1000 gallons of formaldehyde to preserve. Both the heart and the whale’s skeleton will eventually go on display at the museum.